Make a statement with your custom made advertising KD Service Bar The NEW KD Service bar sets up in minutes and starts attracting customers!! Complete with shelves, cooler and umbrella, this unique marketing tool is sure to make your products a hit. 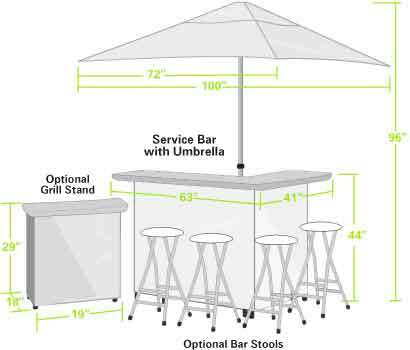 Perfect for food and beverage sampling, patio bars, barbecues, tailgating and special events. Full-color graphics and a wheel bag for storage are included. This unit is easy to set up, easy to clean, and easy to store! Matching grill table and stools are also available and can be printed to match. This Service Bar can be used as Sports Service Bar, Racing Service Bar, Special Event Service Bar, Car Dealer Service Bar, Apartment for rent Service Bar, Real Estate Service Bar, Open House Service Bar, Model Home Service Bar, Attention Service Bar, Grand Opening Service Bar, Flea market Service Bar, Corporate Sponsorship Service Bar, Trade Show Service Bar, Convention Service Bar, School Service Bar, Universities Service Bar, Tailgating Service Bar, Fund Raising Events Service Bar, Fast Food Service Bar, and Retail Shopping Service Bar. Cooler Dimensions: 24" x 11" x 10"